People of the rock, the Mimi are a spirit people of Australian Aboriginal Lore. They bought to Man the knowledge of painting as well as cooking and showed man how to harness fire. Fire is a purely physical need. It is the need for warmth and an instrument of physical comfort and survival. I first heard of the Mimi in childhood legends and was fascinated at the tales that could be found only in campfire Lore. While trying to uncover the secrets of the Mimi People in my research there were things, which I had to understand that were intrinsic to their natures. Firstly they dwelt where many men can’t go and they were a mischievous people. It is said they live in the rocks, or between the rocks, as they are a tall and fragile people who are so fine in appearance that they ‘waver in the wind’. 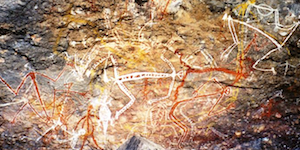 They are depicted in the rock art of the Nourlangie Rock in Arnhem Land or Kakadu in the Northern Territory of Australia where the rock art dates back to the Freshwater period, or the Eocene period of freshwater life. This was some 50 million years ago and was a warm wet period in the Australian continental evolution, marked largely by the absence of the polar ice sheets on the globe. As man didn’t move into the continent of Aus. until 50,000 – 60,000 years ago it is clear that the art depicts a spiritual time, or an epoch of the Mimi people who are a spirit people. Arnhem Land and Kakadu are vast regions of red earth, flooding wetlands and a high isolated plateau that few people ever visit. The region is marked by endless stone escarpments of Kakadu, which tower over the wetlands and protect the plateau lands from the incursions of man. Most tourists think of Kakadu as the wetland’s, a vast wilderness where birds and big lizards gather and thrive and that it is, but it is also a immense plateau region that is mystic and deeply spiritual. It is a step back into the time of the spirit-lands and legend. That the Mimi taught man how to paint is to me relevant. It represents the first teachings of the Spirit world in showing man how to record a history, account for an event or teach in ceremony. It gifts man an identity, a self-awareness and insight into his own nature and presence. This is an important event in the development of man, it recognises his connection to spirituality or a spiritual awareness. 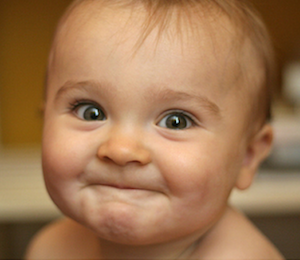 As you watch a child smile, an awareness of sensation even though a baby may not be aware that they smile, they feel the pleasure of the emotion and physical display. This to me is the same as the development of art depicted on rock. It is believed that only the human race smiles and indeed some of the animal species are incapable of smiling due to their mouth/beak structure. Imagine the sense of satisfaction the person must have felt when they sketched the figures and realised that they were telling a story … there was a continuance here, one of invention and the realization in connecting the pleasure with the spiritual thought as depicted in the ancient art at Nourlangie Rock. I have often considered evolution and felt that while Mr Darwin hit the nail on the head, he forgot something. What if evolution is not a gradual development from one physical reality to another, but is also a progression from spirit to physical. He noted and proved in argument that the physical stage is a developmental process down through time influenced by variable factors but what of the spiritual stage? Could it be conceivable that the spiritual stage is the first stage of evolution and then the acquisition of a physical form the second stage? Is this what the Mimi people of the rocks are teaching us in their stories and legends? It is after all what other sectorial religions teach us wrapped up in their own tenets of faith, so are we just being dogmatic and blind to the realities of our own evolution? Like the progression from that first smile that a baby finds, to a self-awareness, onto knowledge of self and on into the personality, the life, the spirit of our existence and life. Then in death, the departure of all that makes us who and we are, it is then where we are reduced to carrion. But we know that energy and matter do not vanish … but they transform into other things be it a form or another entity or presence in its own right. I first examined the tales and legend of the Mimi in Book 3 of the Dreaming Series, Spirits of the Rock and I must admit I had a lot of fun with the concept. I considered that the spirit, the Mimi, part human, part spirit who have little control over their very existence as we have little control but who are closer to the spiritual spectrum of life. I considered that they just may exist in their own dimension and I wondered at what form their society would take as a part of our own world. In the story, the Shaman Andrew along with Taipan, Sean and Tom visit the lands of the Mimi and it has an indelible effect on Andrew, one that walks with him throughout his story. He learns that life is a graduation from the physical to the spiritual and the knowledge gifts him purpose and direction. Andrew is a gatekeeper between the worlds, as is his father and his creed. You can read more about the story on this site, or pop over to amazon.com or smashwords.com and pick up the tale. Check out the discounts at my website. Or if you would prefer a print copy check out the discounts available here which will help with postage costs. This entry was posted in Aboriginal, Australia, Australian History, Traditional Art, Travel and tagged Aboriginal, Arnhem Land, Australia, Indigenous Australians, Kakadu, Kakadu National Park, Mimi, Northern Territory, Nourlangie Rock, Spirit by janhawkinsau. Bookmark the permalink. I would love to find a paperback novel titled “The Ice Cometh” written for the juvenile audience. I’ve forgotten the author’s name, but it’s about a Mimi, rock spirit. I had this small book in the 1960’s and lost track of it.It won an Australian literary award. Do you have any knowledge of it?